He is from the Defense forces and has a mandatory regime to be fit. But, his dietary habits were not as healthy as it should be.3 years ago he had to move out of active field services due to an injury and that was the day he decided come what may he has to work hard and put in all efforts to get back to field services. Within a year, he was able to get back on track to active services. 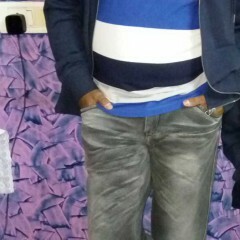 But, what has changed for Jatin Singh now is that while he used to be fit even earlier now he is fitter and motivated. 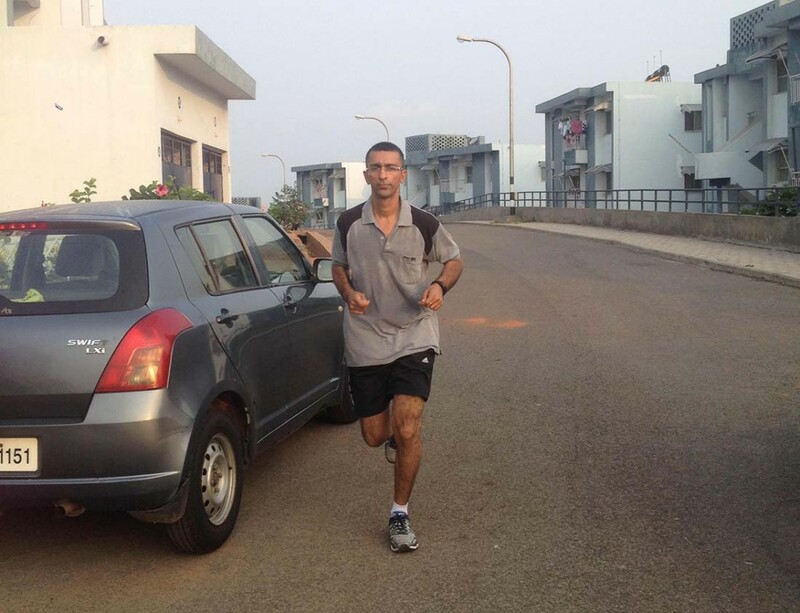 He says, “I am driven and not slacking.” Here is Jatin Singh’s story of change and success in his own words. My story is different from the others in the sense that I was already driven for fitness. I have always been sporty. I was playing Squash at quite a good level and also Basket Ball. I also swim a lot. Also, being a serving officer in the Defense forces we have a regular exercise regime. I was stronger, fit and had more endurance. But, then, unfortunately, 3 years ago I had a bad back injury which was near close to a slipped disk. After that, while I was still in service, I was not on the field. The reason being that once you are in that kind of a situation you are no longer in active service in the armed forces and cannot be serving on the field. I knew that I could not stay away from the field and wanted to get back to active service so I put in a lot of effort to recover well and get back. I wanted to get back to be at the top of my health and fitness to combat any eventualities that may occur as a result of being in active field service. I worked very hard, did a lot of physiotherapy sessions, I had to take care of my diet and did yoga to strengthen my back. Initially, I started walking and then got back to running. I took lots of efforts to get back my fitness and get my back in shape. I was successful and finally got back to field service after a year. But, now my worry was I had worked so hard to come back, I didn’t want to let go of the fitness and the health I had gained at any cost. My back was back in shape but, I had to maintain that. I was looking for something to keep myself motivated to be on the health and fitness track. This was also because the amount of effort and pain I had put in for close to 8 months to get everything back on track, had drained me quite a bit. One day as I was browsing the net, I came across GOQii. I started reading about it. I went through a couple of reviews on various websites and I went through some user reviews as well. I liked what I read and saw. I liked the costing of the band I liked what it was offering especially the personalized coaching where somebody will be constantly motivating you to get on the track of wellbeing. I thought that maybe it might help me get much better as I’d always wanted to. I was intrigued. I decided to buy GOQii and bought one. And after a few months what I realized is that it met all my expectations and did much more. That tiny little tracker was the spark that ignited an enormous change in my life. At the core of my success was the concept in its entirety that when a person tracks and records something related to their fitness or health, they can change it for the better. Using the GOQii online dashboard and my coach’s motivation made it simpler for me. I wear my band all the time. It keeps me motivated 24*7 because I keep looking to see if I am meeting my goals for the day or not. Now I take readings every day and compare them over any time. It sends all of my data to my computer or phone and also my coach is able to view exactly what I have been doing. My tracker is a great tool for my training. Gone are the days of handwritten exercise logs and calculators. I have all of the training data I could ever need at my fingertips. It’s become a great tool to discover trends in my activity, nutrition and show positive progress. The biggest motivator for me is the fact that I am answerable to somebody and that keeps me going. I am not sure if am the only lucky one but, I would like to say that my coach Charmi Gogri is just fantastic. I think she must be twenty years younger to me, but she is so much knowledgeable and has done a fantastic job. She understands me and what goals I want to achieve very well. And her tip on nutrition has been fantastic. I am only doing what she has advised and I have witnessed quite a visible difference not only in my nutrition but at all levels.. I had bad dietary habits before I got injured. I am a Punjabi and ate whatever came my way. Had absolutely no control. I remained in shape and fit only because I played a sport and I did exercises regularly. But, after my injury I was advised to cut down my weight to about 67-68 kg below what was my ideal weight of 74-75 kg for my height and age. I am around 182 cm and currently 40 years of age. I was advised to maintain a lighter weight than the normal so as to put minimum pressure on the back. 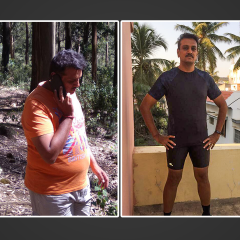 When I was getting back in shape with yoga, walking and running, I had reduced and I cut my weight down to around 68 kgs. I wanted to maintain that weight. I do not play a sport anymore. So ideally, I only run. 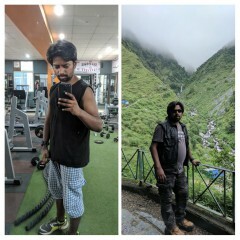 I run only 6 km a day and I have been able to maintain my weight at 67-68 kgs only because of eating right. Thanks to my coach she advised some changes such as smaller portions and frequent meals, healthy snacking between meals and we have been able to stick to that plan more or less. 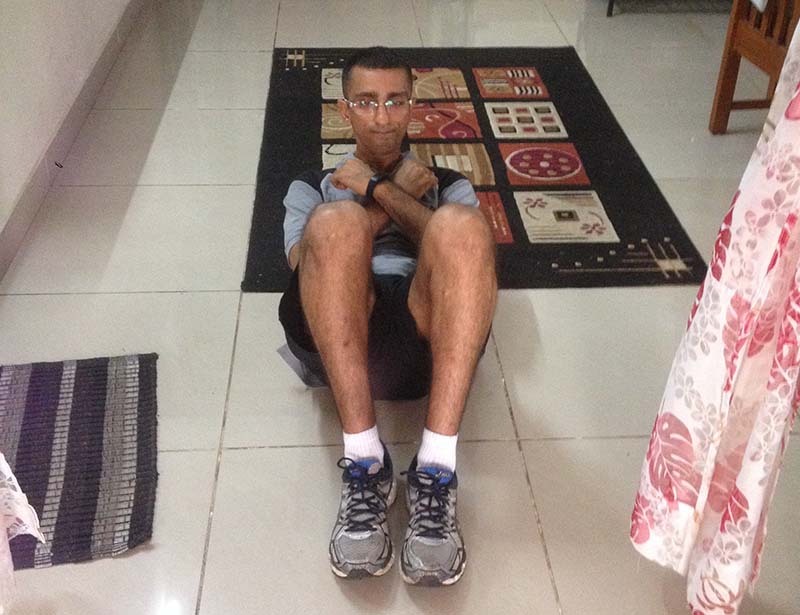 My coach has also advised on a few Yoga asanas to keep my back strong. I do yoga for around half an hour every day. I also do a lot of exercises for my stomach, and when there are days I can’t exercise especially because of lack of time especially when I am on field, she has given me a lot of exercises to do which does not require too much space and can be done when you have lack of time. I tried these exercises and found it very helpful. When I am on field there are times I am incommunicado. My coach has been flexible with my timings and helped not slack off when I am back from field duty. The band keeps me driven that I don’t slack. 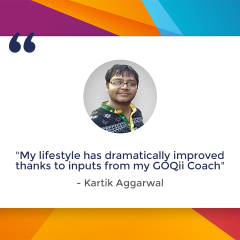 I have been on the GOQii platform since 2014 and it has done wonders for me in the last 18 months. Things changed drastically. I am fit, eating better and right, I am maintaining my weight and am slimmer than ever. When I got injured and was out of active service hence my first goal was to get back to active service. You don’t want to be in services and not be in active service. Now my health goal has totally changed because I have built my fitness. Currently, my new goal is to run marathons. This year I shall do a half marathon and then the full marathon. And the other thing I wished for was to maintain my weight and I am able to do that. I also like the karma initiative. It is a good thing and makes you feel nice once in a while. I would say it is one more motivating factor to stay healthy. I have so far probably donated well above 2000 points. I would say that there are lot of people who have asked me about the band and they are very impressed by me being constantly motivated. Earlier too I used to be fit but never so charged. The 5 things I like about GOQii is 1) coaching 2) the step count and the technology 3) Usability of the app 4) I find the band perfect. It is not very bright in colour and is something I can wear with my uniform and all my clothes. And lastly, I like the response of the GOQii team. They are fast and immediate. Last but not the least I would like to say is that GOQii is a great enabler it gives you the tools and motivation that you need to make your own success story. What does Coach Charmi Gogri have to say about Jatin Singh? (He is almost ready!) and adding a smart and healthy evening snack daily to bridge the long gap between Lunch and dinner (He has been consistent with this one so far ). Very Nice Jatin and salute to you, nice work done by Charmi as well!! Thanks Revati to highlight this very nice inspiring story. Hi jatin capt bist here I too have the goqii band and my fitness tracker too is charming. But still I have not been able to kick my self out to go start the regime. Guide me. I am as you know your senior collegue from the same arm.